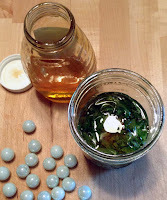 Making an herbal honey infusion is an easy thing to try, and the results are truly a unique taste delight. Your needs are pretty simple; fresh lemon balm, two mason jars with a lid n ring sets, some clean glass marbles, and some honey! 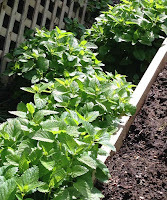 We like to pick our herbs in the morning when they are most potent after the nights cool rest. We grow natural (no pesticides) in our garden so we go straight from harvest to project as any added water can ruin the infusion. 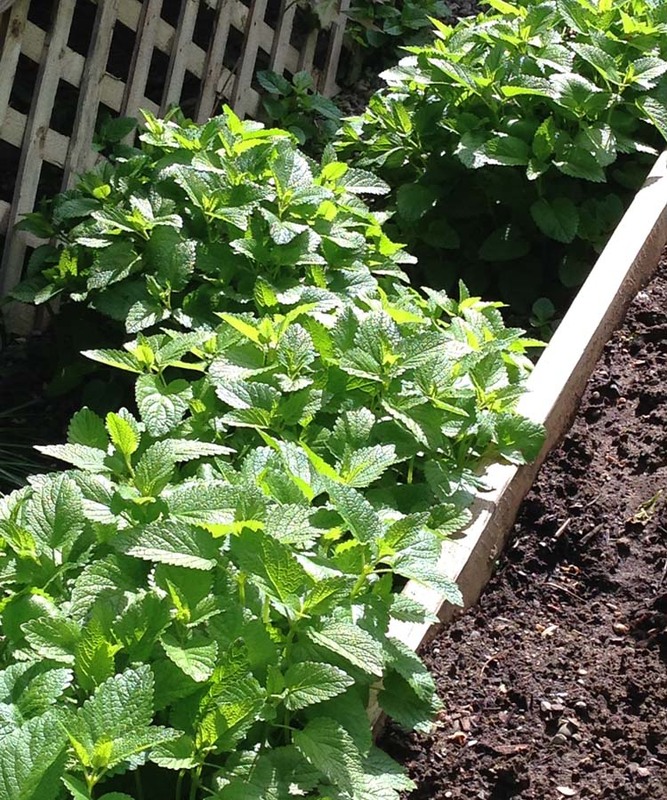 Remove the fresh lemon balm leaves from their stems and fill the jar about ½ full, packing your herbs down. 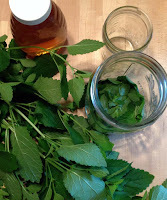 Pour in the honey until it covers your lemon balm; mix gently making sure all the air bubbles are removed, and all the plant matter is covered in the honey. Drop in your marbles to keep the fresh plant matter submerged because mold can develop if it’s exposed to air while steeping. 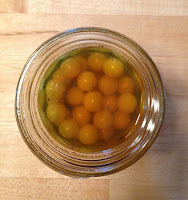 Cap your jar and let sit in a cool dry cabinet 2 weeks to infuse. 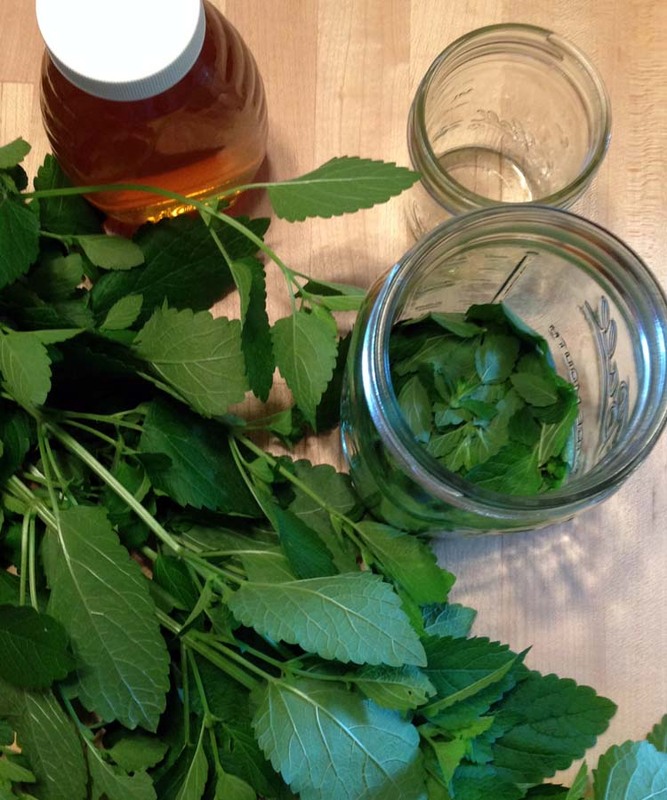 The first week check your honey a couple times, opening the jar and removing any small pieces of lemon balm that float to the surface. You may notice your honey thinning, which happens naturally from the moisture in the fresh herbs. After the second week strain the plant matter from the honey with a small strainer right into a clean jar, and it’s ready to use any way you enjoy having honey, except it has a delicious lemon balm flavor. We are sure you will come up with many ways to try your honey infusion; but one of our favorites is to add it to a classic cheese tray, and they argue whether it’s better drizzled over the Brie and Bosc pear, or smeared on a wedge of Spanish Manchego! Kiss; keep it simple silly; you'll love this appetizer! Summer is here and we're still eating as many clams as possible. One of our favorite ways to have littlenecks is the simplest... a neighbor of ours used to have seafood delivered overnight from Martha’s Vineyard; he taught us this following appetizer. You will need any kind of grill, charcoal, infrared, or propane. Fresh Littleneck Clams; scrubbed, soaked, and rinsed. Fresh Lemons; cut into wedges. Place your cleaned clams on hot grill and cover to steam open. Serve with lemon wedges as soon as the clans open. Yes it is this simple and they are fabulous! Happy clamming. 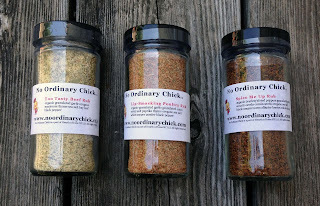 Lip-Smacking Poultry Rub may be used directly on poultry, or added to any coating. *Anytime Beer-Can Chicken serving suggestion: Clean a whole chicken and pat to dry with paper towels. Sprinkle rub generously over the entire bird and place on a beer can with half poured out, then inserted in a beer-can baking rack. Roast in a preheated 350-degree oven for approximately 20 minutes per pound; the first 50 minutes without opening the oven, then baste, rotate and finish baking until a leg is pulled easily away from the bird. Too Tasty Beef Rub may be used on any cut of beef, or burgers to flavor. *Roast Beef Cuts serving suggestion: Pat your beef cut dry with a paper towel, then rub a small amount of olive oil over the entire surface. Sprinkle rub generously over the entire roast and place on a baking sheet; bake as per specific beef cut instructions. 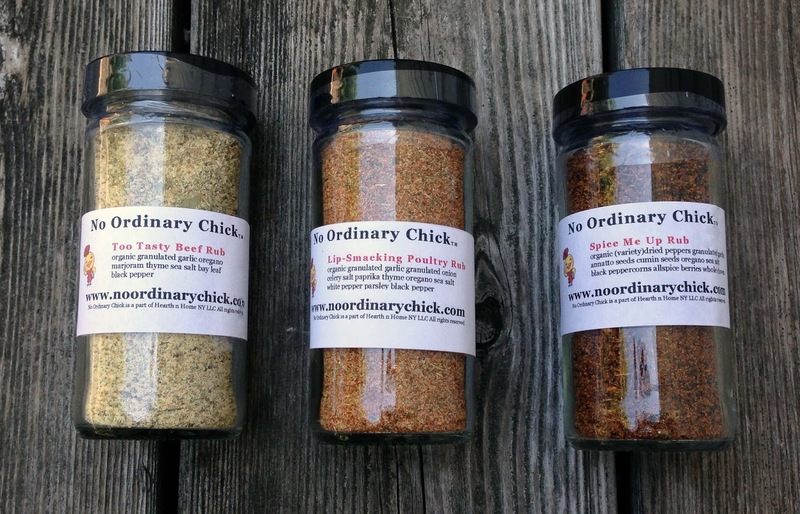 Spice Me Up Rub may be used directly on any beef, fish, pork, or poultry product. It may be added to a grain to finish; and it’s even great on fresh corn on the cob! *Pulled Pork serving suggestion: Cut your boneless pork shoulder into 3 inch hunks and pat dry with a paper towel. Place pork pieces in a baking dish and sprinkle rub generously over all. Cover and place in a preheated 350-degree oven. Turn pork over after first 45 minutes; cover, continue cooking, turning each ½ hour until meat is tender and shreds with a fork.